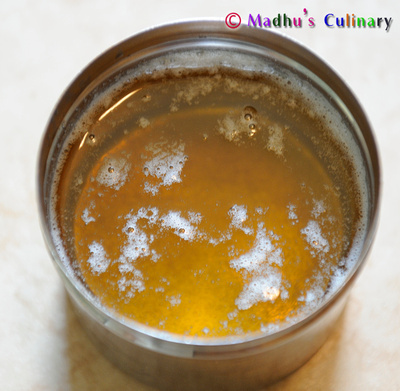 Homemade Ghee ->Suvayo Suvai | Simple Vegetarian Recipes, Easy to prepare and healthy to eat! 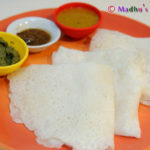 Note: If you prefer, you could make the butter at home from curd. I will post a separate Recipe on how to go about doing this. 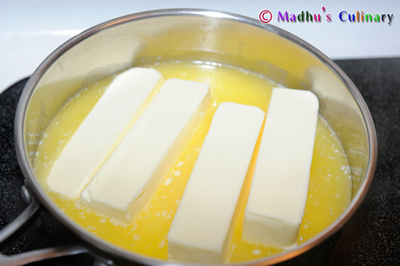 Take a heavy bottom pan, add the butter sticks (or plain butter) and let melt the butter. 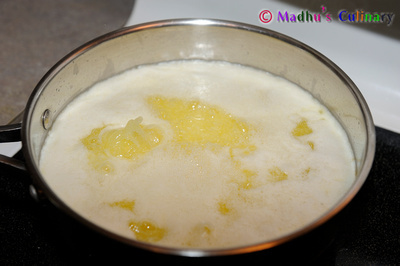 Once it melts, the water globules and the milk solids float to form a pale white layer on the top. Cook it in the medium flame. Do not cover the pan with the lid throughout the process. 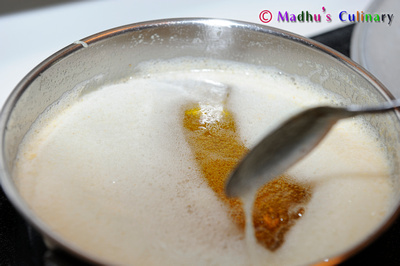 During this slow process as the butter boils, the water content evaporates, milky solids begins to break up. You will first start to see noisy bubbles. Then start to see a foamy build up and fat (yellow) starting to show up. Now is the right time to slightly reduce the flame. Since from here on it will be quick and fast, keep an eye on it. 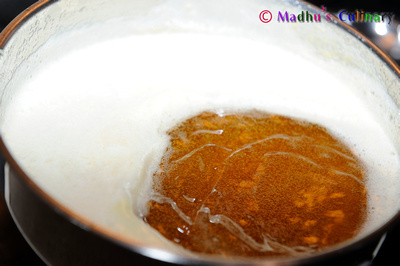 As the foamy build up starts to cover the top layer fully (white froth), beneath it the milk solid is completely broken up leaving a rich golden oil. The milk solids (lactose and casein) would finally settle at the bottom. Switch off the stove. You can keep it on top of the stove for 2 minutes. Now you can see clear golden-yellow liquid with a little bit of foam floating around. 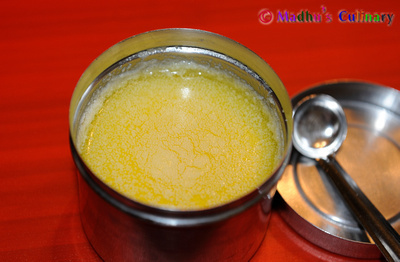 The ghee is ready, keep it aside for few minutes. 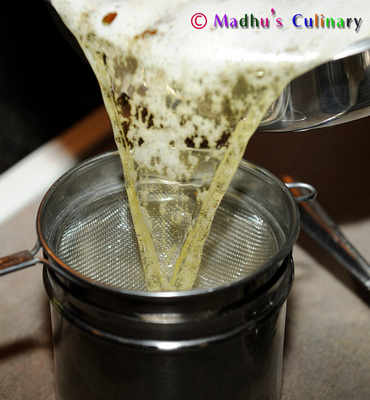 Strain the ghee using a tea strainer. Throw the impurities (milk solids). You can store it in the dry, cleaned, air tight stainless steel jar or glass jar. You can keep it in the room temperature. 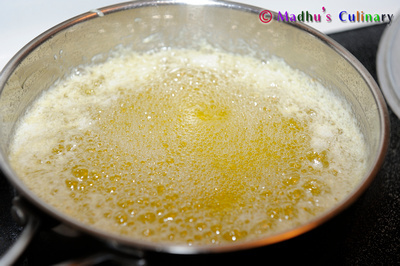 Now the ghee is in the liquid state, when it is totally cooled down it will be more in the semi- solid state. 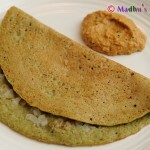 The consistency should be like holding smooth beach sand in the hand when at room temperature. Stainless steel pan is more preferable. 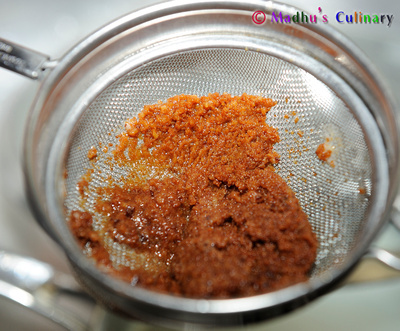 Use dry spoon for using the ghee and replace it after use. Keep away from moisture (thus keep it airtight) and sunlight in a dry, dark place (like inside a cabinet). 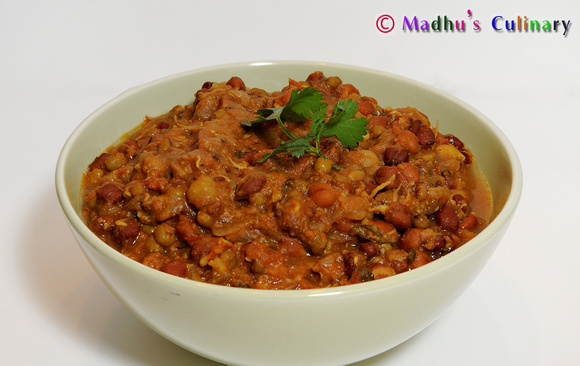 Helps fight against acid reflux, ulcers and other digestion problems. 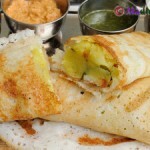 Mix the sugar and few spoons of ghee, you can eat it with any Indian tiffin items, like Dosa ,Idli ,Upma, Roti. 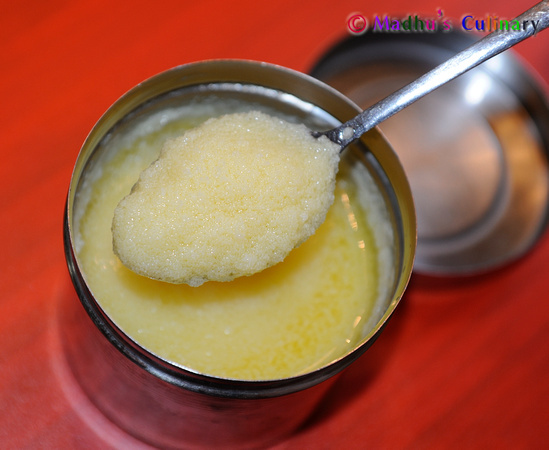 Make any Indian sweet using ghee. 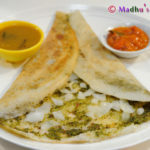 The milk solids that collects at the bottom which we filter out can be used by sautéing it with curry leaves and eaten as crunchy curry leaves. 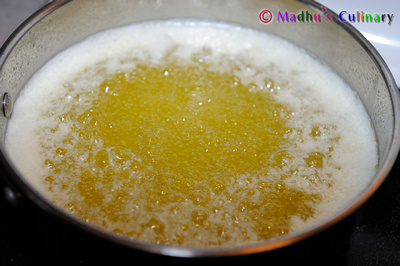 Wash the Ghee jar using hot water, you can remove the grease easily.